The origins of survival/horror games could be debated - which games came first, what games first featured horror elements - but it is universally accepted that Resident Evil created the survival/horror genre as we know it when it debuted on the PlayStation in 1996. So it’s fitting that arguably the best horror game of the current console generation is Resident Evil 7 (PS4,XBOXONE,PC). With 20 years of history and a dozen fan-favorite characters to utilize, Capcom made a bold choice having seemingly moved away from the franchise’s past when Resident Evil 7 released, and it was all the better for it. RE7 transitioned from the familiar third person perspective into first person gameplay. The move in gameplay added to the immersion and helped create a strong claustrophobic sense while exploring the tight-corridors of the Baker’s house of horrors. 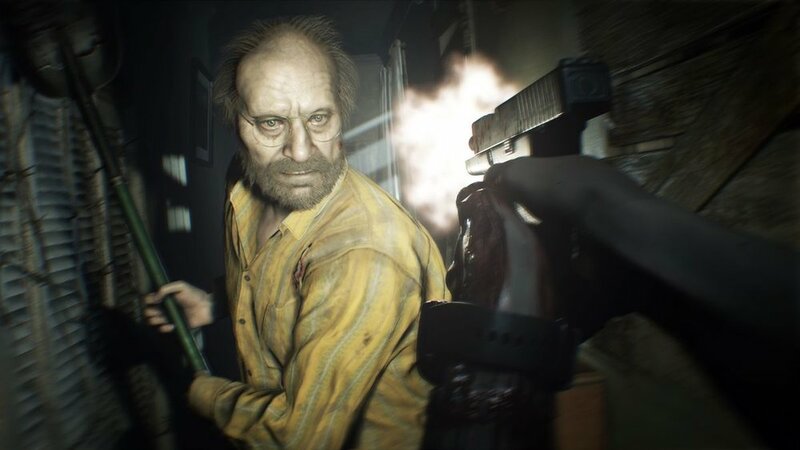 Despite the perspective shift, RE7 held true to some of the franchise’s signature gameplay elements; limited resources, herbal mixtures, typewriters, puzzle solving, and intense close quarters combat all return in familiar form. When first starting, it’s easy to think the series has hard rebooted but once in the meat of the game, it’s clear that RE7 stays true to the series’ heart and soul. While mechanically the game draws from new and old, the story and theme does the same. There seems a greater influence from classic horror movies like Texas Chainsaw Massacre, The Hills Have Eyes, and even Psycho when it comes to the cannibalistic Baker family. Even the setting, a derelict plantation in the American swamp, seems to have pulled inspiration from some of Hollywood's finest films. None of this means that the game tread familiar ground or feels like a simple tribute, it all adds up to a comfortable DNA for horror fans. Players follow new Resident Evil protagonist Ethan Winters as he follows a mysterious video message in an attempt to find and save his missing wife Mia. The trail leads him to the seemingly abandoned Baker Plantation and that is where the game begins for the player. Ethan begins to explore the property and the situation quickly begins to deteriorate. Of course as the situation gets worse for Ethan, it just gets better for the player. Resident Evil 7 features some of the strongest horror in the franchise to date, particularly the first two acts. The first consists mostly of Ethan playing a horrifying and deadly “game” of hide and seek with Baker patriarch Jack, while attempting to escape and find clues to what has happened to Mia. The setting channels the best of the likes of House of 1,000 Corpses and Texas Chainsaw Massacre providing equal parts terror and mystery with signature puzzle solving while new enemies bare down on you. Smartly the game keeps combat infrequent and with the limited resources all enemies provide a serious threat and danger. I will say, working my way through the Baker’s basement is easily the most tension i’ve felt playing any game in the series. I’m a firm believer in not delivering spoilers, so I’m not going into detail about the story beyond the basics. However, in a series with a penchant for overly-complicated stories, loose ends, and inconsistent characters, RE7’s smaller, more isolated story is a step in the right direction. Rest assured it does connect to the Resident Evil universe at large, through the current state of said universe is complicated at best even for those who’ve played all the games. While this game doesn’t do anything to clear up the current condition of the overall story, the plot is fairly self-contained and wraps up enough. Beyond the main game itself, Capcom has provided a number of post-release DLC additions including Ethan Must Die mode - a randomly generated single life survival mode, and multiple additions to the story that act as prequels providing more to the Baker family’s background setting up how we get to where we are at the start of the main game. While the game isn’t perfect, it sets a new watermark for mainstream horror games at the height of their current resurgence. It provides a satisfactory combination of scares and fun, in a fast paced and relentless onslaught. While the main game may feel on the shorter side, it benefits the genre in general to not drag on for too long. Fortunately the DLC provides a lot of supplemental material to keep you playing after the credits roll. Ultimately it's a great new addition to the franchise and is worthy of the Resident Evil name. Best of all it made me excited for what comes next, which is a far cry from what Resident Evil 6 did for most fans.